We’re very excited – Christmas is officially on its way! 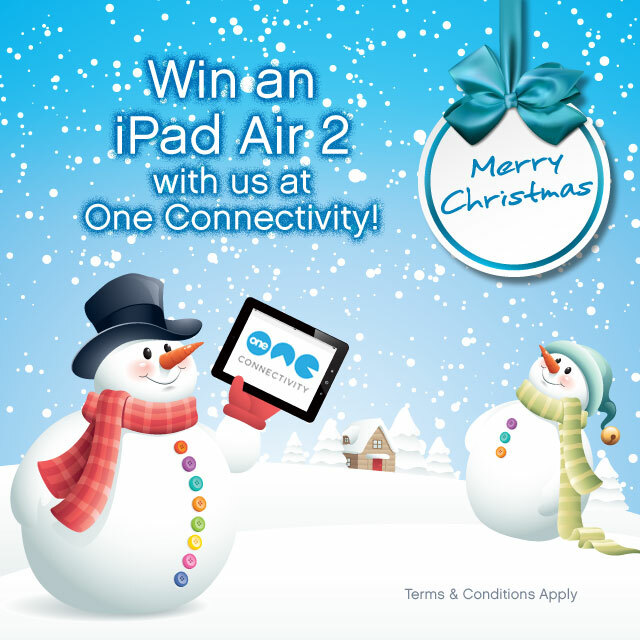 To celebrate, the One Connectivity team would like to offer you the chance of winning an Apple iPad Air 2. Colour options are White, Silver or Space Grey – your comment on the competition post does not guarantee the winner the prize in their preferred colour choice. The prize cannot be exchanged or transferred by ‘You’ and cannot be redeemed for cash or any other prize. We take no responsibility for entries that are lost, delayed, misdirected, or incomplete or cannot be delivered or entered for any other technical reason. Proof of delivery is not proof of receipt. Nothing in these Terms and Conditions shall exclude the liability of One Connectivity Limited for death, personal injury, fraud or fraudulent misrepresentation as a result of its negligence. One Connectivity Limited accepts no responsibility for any damage, loss, liabilities, injury or disappointment incurred or suffered by ‘You’ as a result of entering the competition or accepting any prize. One Connectivity Limited further disclaims liability for any injury or damage to ‘You’ or any other person’s computer relating to or resulting from participation in or downloading any materials in connection with the competition. One Connectivity Limited reserves the right at any time and from time to time to modify or discontinue, temporarily or permanently, this Competition with or without prior notice due to reasons outside its control (including, without limitation, in the case of anticipated, suspected or actual fraud). The decision of One Connectivity Limited in all matters under its control is final and binding. One Connectivity Limited shall not be liable for any failure to comply with its obligations where the failure is caused by something outside its reasonable control. Such circumstances shall include, but not be limited to, weather conditions, fire, flood, hurricane, strike, industrial dispute, war, hostilities, political unrest, riots, civil commotion, inevitable accidents, supervening legislation or any other circumstances amounting to force majeure.